The opening of this week's portion - And it will be, because you will heed these ordinances and keep them and perform them, that the Lord, your G-d, will keep for you the covenant and the kindness that He swore to your forefathers. The word in Hebrew for "because" in this context is Eikev (hence the name of the portion) which can also be translated as heel. Thus the Talmud states, that if we guard the commandments that usually are stepped on with the heel (smaller Mitzvot) then we will receive G-d's belssing. There are big issues in life and there are small issues. Now, I am not suggesting that we make big issues out of small ones. But sometimes there are small issues that are really not so small, but we might make them out to be insignificant because they don't occupy a significant space in our life. Or perhaps, we might see them as small issues in our lives, but big issues in someone else's life. The Torah says, that when we don't overlook the small issues, and we identify what is truly valuable and important, then G-d will respond in kind. Sometimes there are issues in our lives that might really be insignificant. We ourselves might look back at it and see that it was indeed insignificant. But, when we recognize that the "small" issues are really not so small, then G-d responds by taking care of our "small" issues. Here are some small issues in your life that are really not so small; Shabbos Candles, putting a daily penny in the charity box before you head out to work in the morning, kiss the Mezuza or put up a Mezuza. All of these "little" Mitzvahs and any other one that you might consider little causes G-d to see that we care. And when we show Him that we care about His small issues then He shows us that He cares about our small issues. As I was reading this week’s Torah portion Parshas Va'etchanan which begins with the verse “I entreated the Lord at that time, saying”, I started to wonder what prayer is. In this week’s Torah portion the word used is “Chanun” entreat. Also know as a request. One of the other terms for prayer is “Teffilah” which means connection. Prayer means different things to different people. For some it is a request from G-d to do a certain thing. I want to be successful, I want my friend to get better, I want to find a spouse etc. For others it is a time to reflect, a time to reconnect. A time to find a connection between who I am and who I want to be. Do I want to be G-dly? Can I express G-dliness in my daily action? 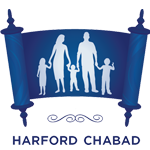 When Chabad of Harford County opens its doors would you like there to be prayer services? I was arriving into Melbourne international Airport, the captain announced “welcome to Melbourne, please look around your seat for portable electronics and any small children you may have left behind”. So here I am raising capital in order to be able to start Chabad of Harford County. The most common question I am asked is Why? Why would you take your family to an area foreign to your lifestyle as an observant Jew? Why are you non-judgemental? Why will people accept you there? Before I tell you what I answer them, ask yourself what you think I would answer them! This week we began reading the book of Deuteronomy, book 5 of the Five Books of Moses. The Hebrew name of this book is Devarim, which means things. Devarim begins with the verse ‘These are the things that Moses spoke’. It made me think of the power and effect our words have. I realized that whatever answer I give can have a lasting effect, the power of my words can affect the person deeply. So I tell the questioners: Man was put on this world to do a mission; to change the world, to build a place where G-d will be comfortable. A Home for G-d. In Harford County there are nice people, Jews, Non-Jews etc. Is G-d comfortable there? Is it a place where He can call home? I know that I together with you can make it that way. Is looking at your neighbors green lawn actually that bad? Isn't it a good thing to want to have greener grass? What might be wrong with wanting the nicer car, the nicer house, the more united family, better marriage, more peaceful demeanor than you might have? Of course we are not talking about jealousy, that's a sin. We are talking about striving for something better in life! The answer is that we don't have the entire picture. We don't really know what comes with the green grass, what other complexities exist in that person's world. Not necessarily that they have other problems. But, that we don't really know what G-d's master plan is, what the nature of that person's soul is, the circumstances in which it was put on this earth are, the challenges and tools that it receives to achieve that Masterplan. This is what this week's two Torah portion names mean. Matos - Staff or stick. Strong and mighty in one's convictions and Masay - journey, a commitment to moving forward along the journey of life. Conviction that we are limited in our understanding of the Masterplan but that there is a plan. And a journey towards being a better person. In Hebrew, it's called Bamidbar ("In the Desert") and also Sefer HaPekudim ("The Book of the Countings"); in the English-speaking world, this is the biblical section known as "Numbers." And yes, there are many, many numbers in the fourth of the Torah's five books. In its opening chapters we learn that one year after the Exodus, there were 603,550 adult Israelite males between the ages of 20 and 60, of whom 22,273 were firstborn; a separate census counted 22,300 Levites age one month and older (7,500 Gershonites, 8,600 Kehattites, and 6,200 in the Merrari clan). We are also given the figure for each of the twelve tribes, from Judah's 74,600 to Menasseh's 32,200. Then the Torah tallies the number in each of the four "camps" into which the twelve tribes were divided: Judah's camp, which also included the tribes of Issachar andZebulun, totaled 186,400; the three tribes in Reuben's camp totaled 151,450; Ephraim's camp included 108,100, and 157,600 pitched their tents in the Camp of Dan. Twenty six chapters and 39 years later we're still in the Book of Numbers and in the midst of another census. Again, we get the total figure (now 601,730) and the numbers for each tribe. We notice that Simeon has been tragically decimated (22,200, down from 59,300) while Menasseh's ranks have swelled to 52,700 (a gain of 20,500). But most of all we notice howG-d's passion for counting His people has not waned. For, as G-d says to Moses, we're not just counting people. We're "raising their heads." When a census is taken, the count will include scholars and boors, professionals and vagabonds, philanthropists and misers, saints and criminals. Yet each counts for no more and no less than "1" in the total number. The count reflects only the one quality they all share equally: the fact that each is an individual human being. So is a headcount an expression of the lowest common denominator in a collection of individuals? The answer depends on how one views the essence of humanity. If man is basically neutral or worse -- if we all begin with zero and make of ourselves what we are -- than what unites us as individuals is indeed the least of our qualities. G-d, however, has a different perspective on the "huddled masses" of man. As G-d sees it, the soul of man is a spark of His own fire -- a spark with the potential to reflect the infinite goodness and perfection of its source. Human life is the endeavor to realize what is implicit in this spark. Indeed, a person may lead a full, accomplished and righteous life and barely scratch the surface of the infinitude of his or her soul. Another person may blunder for a lifetime in darkness and iniquity and then, in a moment of self-discovery, fan their Divine spark into roaring flame. So when G-d instructs that we be counted, it is an expression of ourhighest common denominator. On the Divine census sheet, our differences are transcended to reveal the simple fact of our being -- a fact which expresses what is best in us, and from which stems all that is good in us. G-d counts us not to know our number (which He obviously knows), or even to get in touch with the quintessence of our souls (which He obviously is). He counts us to accentuate our soul of souls, to give expression to its essence and to make it more accessible to our material-bound lives. Therein lies the deeper significance of the idiom "raise the heads" in G-d's instruction to Moses to count the people of Israel. When G-d counts us, He is stimulating the highest and loftiest part of our being, the spark of Divinity which lies at the core of our soul.